JNN 08 Dec 2014 Istanbul : Turkish President Recep Tayyip Erdogan on Saturday corrected press reports stating his grandiose new palace has 1,000 rooms, saying it actually boasts 1,150. 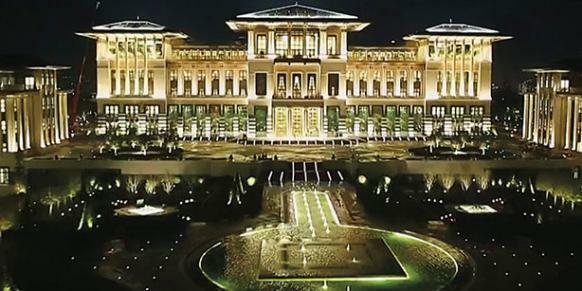 The presidential palace, built in a suburb of the capital Ankara at a cost of around 490 million euros ($615 million), covers some 200,000 square meters (2.15 million square feet) — more than 30 times the size of the White House and bigger even than France’s majestic Palace of Versailles. The opposition has condemned the vast palace as an absurd extravagance that shows Erdogan is slipping towards authoritarian rule. “This is not my palace, it’s not private property, it’s the people’s, it belongs to them,” Erdogan said. The first foreign visitor to the palace was Pope Francis last month, followed by Russian President Vladimir Putin last week. Turkish President Recep Tayyip Erdogan on Saturday corrected press reports stating his grandiose new palace has 1,000 rooms, saying it actually boasts 1,150. The first foreign visitor to the palace was Pope Francis last month, followed by Russian President Vladimir Putin last week. This entry was posted in Europe, Jafria and tagged majestic Palace of Versailles, Pope Francis, president vladimir putin, presidential palace, Recep Tayyip Erdoğan, russian president vladimir putin, Turkish President Recep Tayyip Erdogan, White House. Bookmark the permalink.